Gwenfar's Garden and other musings: Cultivate! There is an exciting new food initiative in Oxford, Cultivate. It's a new food co-op that is to be community owned, run and financed by people local to Oxford. I'm personally keen on Cultivate, not just because I know some of the wonderful people involved in setting it up (! ), but also because I think the model they will be working on is great. They will be running a VegVan that will come to any part of the Oxford area where locals want them to come. This means not just the better-off areas, but the less well-off areas of Oxford. If people want the VegVan to come to their area, they will be able to work with Cultivate to make it happen. Cultivate will have 5 acres of land in South Oxfordshire, and will also work with other local organic farmers and veg box schemes to source the food they will sell in the VegVan. I like this as it will be local food people working together, not against each other, and will help build a more sustainable and resilient food system in the Oxford area. 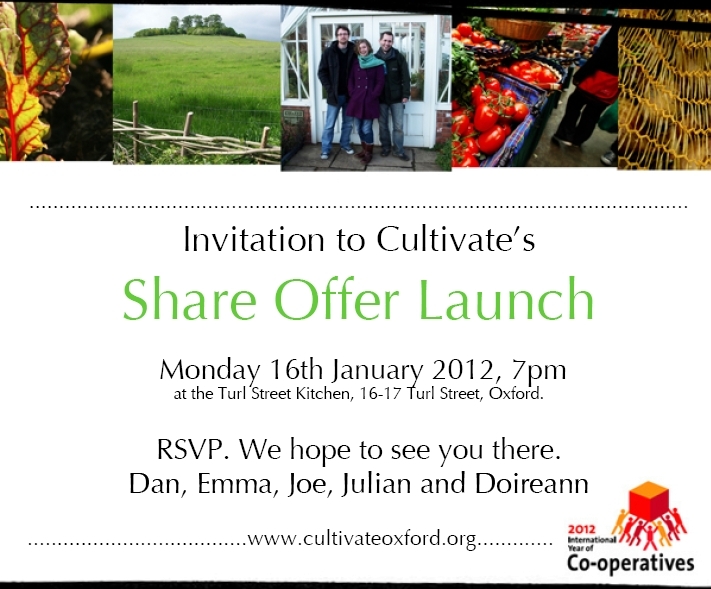 The reason I'm particularly blogging about Cultivate now, is that they will be opening the Community Share Offer on Monday 16th January, at their launch event. 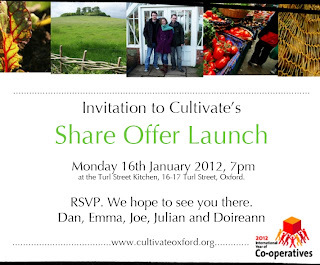 So if you would like to find out more, do RSVP to them at info@cultivateoxford.org. If you cannot make the event, you can also join their mailing list and they will keep you up-to-date with information on the share offer and other news.